Hooligan flat track racing is the same. But here, the upgrades are done by racers and builders on tight budgets. Not massive teams of engineers with eighteen-wheeler trucks full of SnapOn tools. 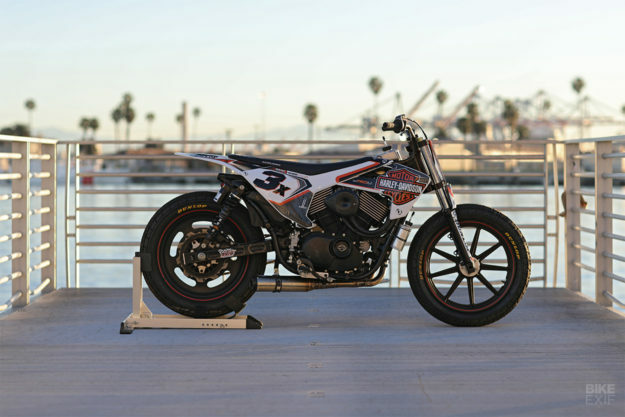 So we’re fascinated by the way Scott ‘T-Bone’ Jones of Noise Cycles has rebuilt his fire-breathing Street Rod 750 tracker. It’s the same 2017-spec XG750M he raced with last year—but it’s evolved radically since then. 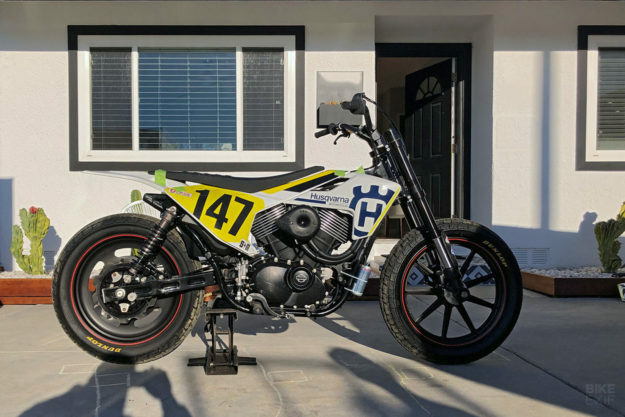 As the season ended, Scott and teammate Brandon ‘Gonz’ Gonzalez had a clear idea of how to build a better racer…so they did. The initial idea was to build a new one-piece body, out of fiberglass. 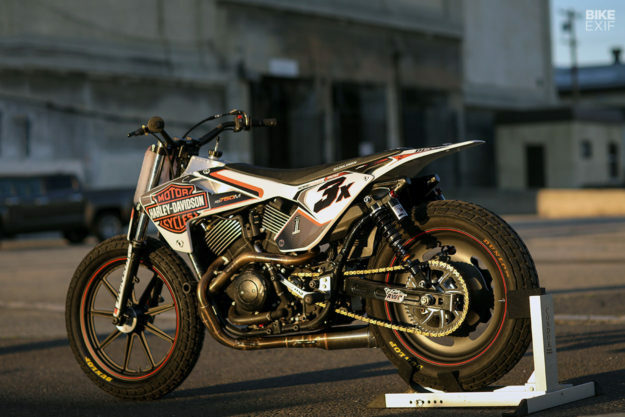 But after taking inspiration from pro flat track and supercross, the guys started wondering if they could simply adapt a set of motocross panels to fit the Street Rod. The fit, amazingly, was close to perfect. So Noise acquired their own set, and massaged it to fit—fabricating mounts to attach the panels to. Most of the cutting happened on the left, where some plastic had to be trimmed away to make space for the left cylinder head and exhaust header. Scott then fabricated an aluminum fuel tank to hold just enough fuel for race runs. It attaches to the Street Rod’s backbone and the left side of the frame, with rubber grommets to dampen vibration. And yes, it took some crafty sculpting to utilize the maximum amount of space available. Seat specialists Saddlemen hooked Noise up with a new seat pad up top. And 270X designed, printed and applied a custom decal kit. Scott and Gonz considered trimming the rear frame rails more (they’d been cut for last year’s build), but they decided to focus their attentions elsewhere. After all, they were building the bike up in a 4×8′ space they’d cleared in Scott’s home garage, wedged in between multiple other projects. Just a handful of mods stayed on from last year. 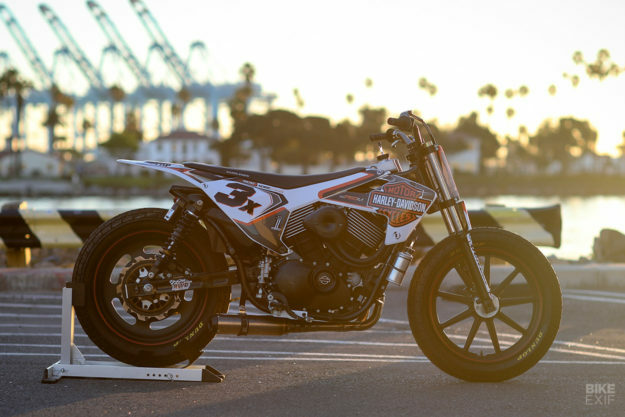 Scott’s still running the same wheel combo: a 19” Sportster front wheel, with a 19” V-Rod front wheel adapted for the rear, fitted with a quick-change sprocket. The engine hasn’t been touched much either, and still runs an S&S Cycle air cleaner and a Vance & Hines FuelPak3 tuner. And the cylinder heads are still flipped. 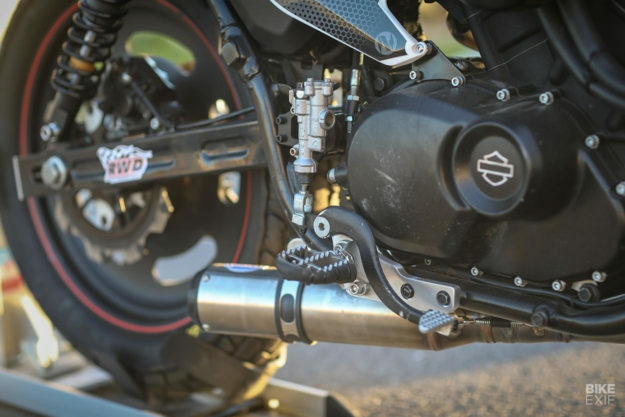 Yes, you read that right: Scott went to considerable lengths last year to flip the heads, so that he could run a high, left-side exhaust without a crazy tight radius bends in the headers. But he hated burning his pants on the exhaust all the time, so he decided to change it. And since flipping the heads back was too much effort, he built a custom system that would exit into the left, then shoot through to an S&S prototype muffler on the right. Gone is the Red Bull oil catch can that Scott dug out of a trash can and taped to his bike last year. A custom-made aluminum unit has replaced it. 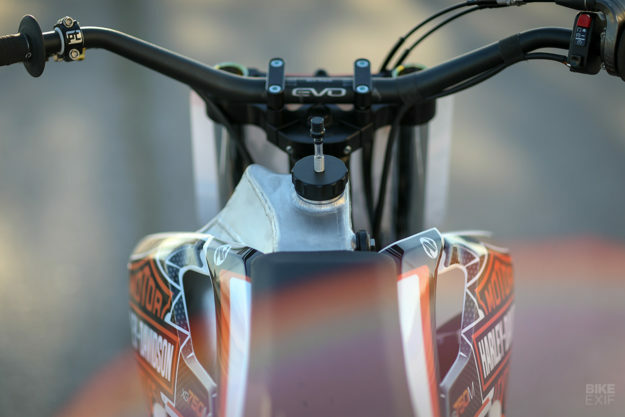 Other tweaks include an MX foot peg on the right, and a custom shifter setup on the left. 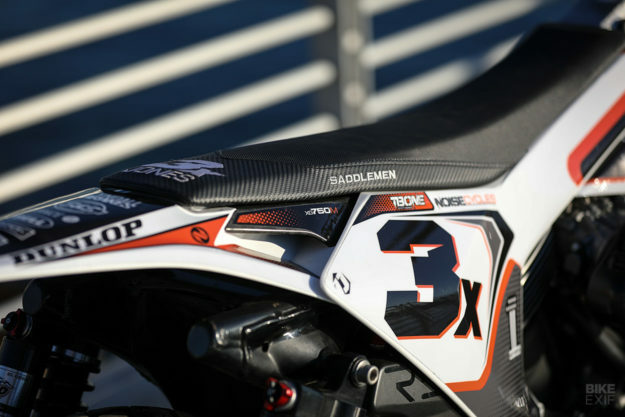 The cockpit’s sporting Pro-Taper bars and a Pro-Taper clutch levers, a Motion Pro throttle and Scott grips. 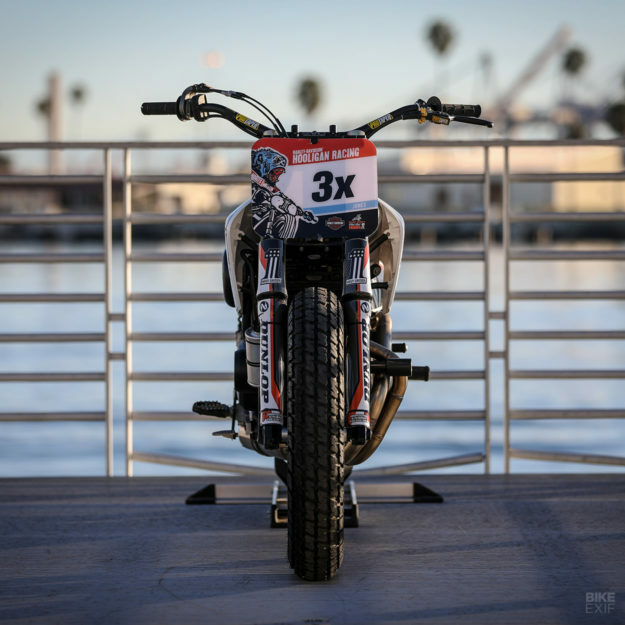 The rear brake’s been upgraded to a Lyndall Racing rotor and a Honda CRF master cylinder. Scott’s Street Rod is also sporting an all-new and vastly improved suspension setup. Up front, he’s got the same S&S Cycle triples and risers the Indian factory team runs, with a custom stem. 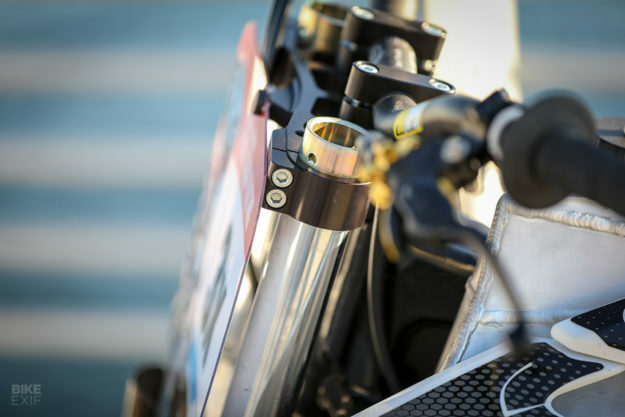 They hold a set of Yamaha R6 forks, making the front end lower, lighter and tunable. There’s a pair of 15” custom valved RWD shocks out back. Geometry-wise, the Street Rod now has a slightly shorter wheelbase and a touch less rake. And with narrower bodywork and a longer seat, Scott can use a lot more body English. It makes for a much more responsive bike and a much happier racer. 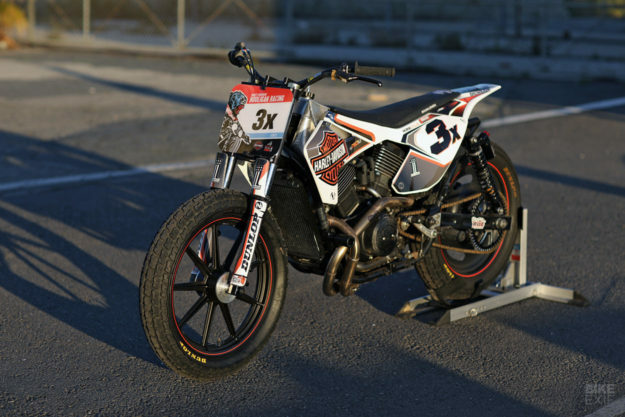 It’s also one of the most interesting Hooligan bikes we’ve seen. 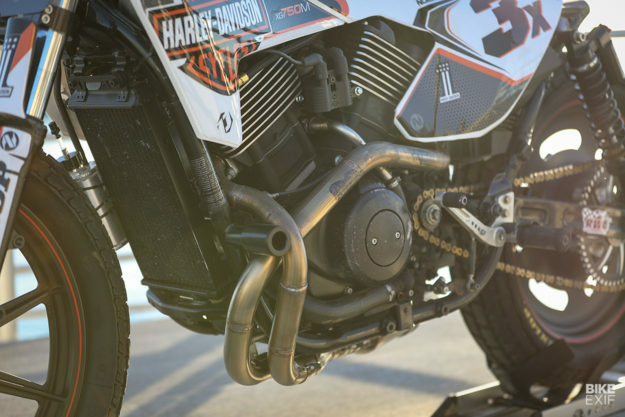 You’d think MX plastics on a Harley-Davidson would look weird—but it works surprisingly well.